2014-12 ~ Pipaldanda School ~ Business As Usual! It's business as usual for the teachers and pupils at Pipaldanda school now that their old school has been demolished and frenetic work continues to complete the new school. The slideshow below captures some of the atmosphere of "Keep Calm and Carry On" during the final stages of building. Here can be seen the inside and outside of then new building being plastered, electric sockets and lights being installed, window and door frames being fitted. 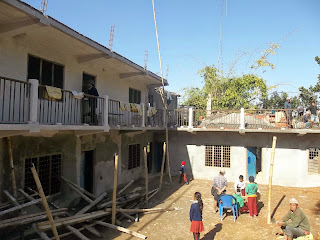 As yet there is no staircase up to the second floor of classrooms, this is due for completion by the end of December.